I came to a red light while driving to work in Hollywood, CA, when a homeless woman caught my attention. At the time, I was working as a stylist for a few years yet my career wasn’t evolving they way I wanted. In between gigs, I was on my way to return clothes at a showroom when the best thing that’s ever happened to me happened to me. The woman was very tall, thin, chocolate complexion, with a buzz cut, and random patches of dirt covered her body. She began to cross the street, then I noticed her blood stained bottoms. She had no pants on, just a ripped, dirty tank top and some shorts as underwear. I was in my car tripping, looking around to see any reactions from the people in the other cars because she was so exposed. I watched her get across, being caught up in my thoughts and emotions, I had just started my cycle that day. Next to crosswalk was a Trader Joe’s, once on the side of the building, still in plain sight, she proceeded to pull down her bottoms and squatted. That entire moment of from when I first saw her to the light finally turning green, may have only been 2 minutes but it felt like forever to me. 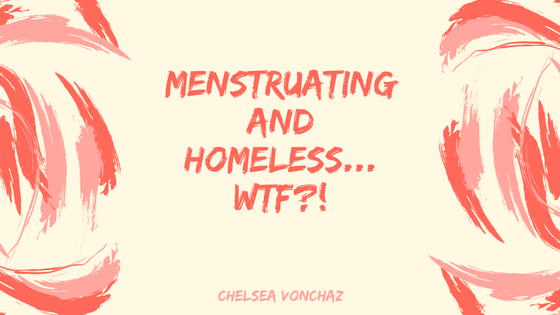 I had so many questions, but the one question that was burning in my heart was, "What the hell do homeless women do when they have their period?" People with periods should be able to manage their menstrual hygiene stress-free and with dignity. However for individuals experiencing homelessness or living in poverty, that can be a dreaded monthly challenge. Menstrual products are not easily accessible or affordable to everyone. Homeless women and girls may use unsanitary materials such as plastic bags, old rags, newspaper, dried leaves, or socks, because they do not have access to menstrual products. 1 out of 10 girls in the developing world miss up to 5 days/per month of school because they don’t have sanitary pads. Poor menstrual hygiene not only affects physical health, but also social and mental well-being. Taboos and stigmas related to menstruation often portray women and girls inferior to men and boys. Commercial pads and tampons are made more expensive because of import and sales tax, effectively taxing females for their physiology. Seeing that homeless woman is what inspired me to create my organization, #HappyPeriod. #HappyPeriod provides menstrual care items to homeless communities, and we’ve been in service for over two years now. We hold volunteer events to collect donations and assemble everything into menstrual hygiene kits, then pass them out through street distribution and shelter drop offs. We have created a simple model, easy for volunteers to get involved, no matter their location. We currently have chapters in 10 cities across the country. I wanted to see a change and I decided to not wait on someone else to do it. I say create what you wish existed. I didn’t ask for permission to make a difference and you shouldn’t either. #HappyPeriod was founded by Chelsea VonChaz and her Mother, Cherryl Warner, on February 8, 2015. For those that would otherwise go without. #HappyPeriod is a social movement of girlfriends providing menstrual hygiene kits. Our initiative supports anyone that is homeless, low-income, and/or living in poverty. Including LGBT, non-binary, teens, veterans, and disabled.